Last night NBC News With Brian Williams broadcast a medical report segment by Dr. Nancy Snyderman that called into question how this country defines, diagnoses and treats back pain. The report points out how common back pain is in our population and the problems that arise because of how it’s currently treated by the medical community. Expensive testing, surgery, and prescription medications are called into question for their effectiveness as well as their expense. The report correctly points out that most back pain is the result of a weak core – a much more complex region of the body than the infomercials fascination with “abs” – and that readily available physical therapy is often the best treatment for the condition. Dr. Snyderman specifically mentions Pilates and yoga as healthy, affordable alternatives to the much more common medically prescribed routes handed out by practices and hospitals. If you or someone you know suffers from back pain in varying degrees, it’s highly likely Pilates can be a very effective part of a treatment plan to properly alleviate the condition. This entry was posted in Classes and tagged abs, back pain, core, therapy on July 31, 2013 by Susan. Girl power! hanging out at a weekend workout in boca with my pilates peeps! Sometimes You Need To Have Someone Else Looking Over Your Shoulder! In June I visited Pilates of Boca in Boca Raton where I was first Power Pilates certified to learn about Swami Juice and for a day long work out with some former classmates. I was happy to see so many of my former gal pals under slightly more relaxed conditions than our formal training and was glad to be able to partner with my friend Lee, from my original Power Pilates certification class. We were all exhausted after a full day of going over the basics and then making sure we were up to par on our PIlates technique. It was a great weekend getaway – Boca Raton on old U.S. 1 is one of my favorite places for relaxing! This entry was posted in Classes and tagged certification, teaching on July 5, 2013 by Susan. Just Don’t Call It Pilates! This article in the New York Times titled “A Souped-Up Pilates Workout” made me think about what’s behind the comments people make when it comes to their idea of how they should feel after a workout. I suspect she’s never tried a Classical Pilates class, one that incorporates flow with breath and mind control. Too often the group classes offered at gyms and clubs fall far short of what Joseph Pilates intended and end up like a lazy day at the beach. At Your Pilates Lifestyle, I offer classes for all levels from beginners to professionals, and pay particular attention to those who may be physically challenged yet who will still get plenty of benefit from a toned down Pilates routine. At the other extreme are my superfit clients, the ones who thrive on an intense Pilates workout. One that includes plenty of non-stop flow that leaves everyone short of breath and dripping with sweat! Cardio? You’d better believe it! You may not be working to capacity in the beginning as you are learning the exercises and correct body mechanics. However, as you move into intermediate, advanced or even super advanced exercises you should be working to capacity. If you’re not – it’s on you!! Joseph Pilates was a genius when it came to the order and flow of his exercises to work the entire body in a demanding and efficient way to achieve total body FUNCTIONAL fitness. When was the last time your daily life required you to bench press a desk to fatigue? There really is no reason to change Pilates as it was designed unless it’s to periodicially shake things up and challenge the client in a totally different way. 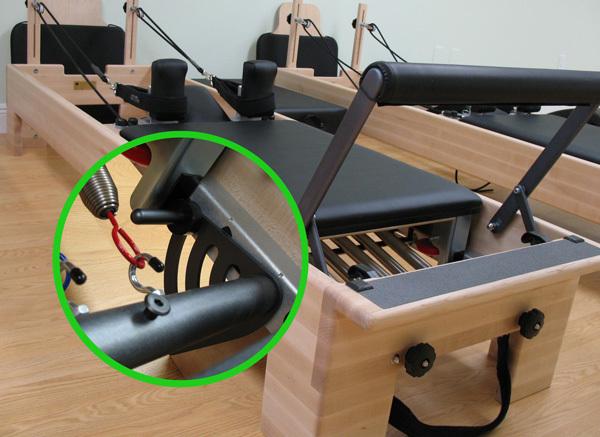 The reformer is a brilliant piece of equipment that can be used in many ways. If you’re going to use it to perform gym based exercises, then it should be labeled accordingly. 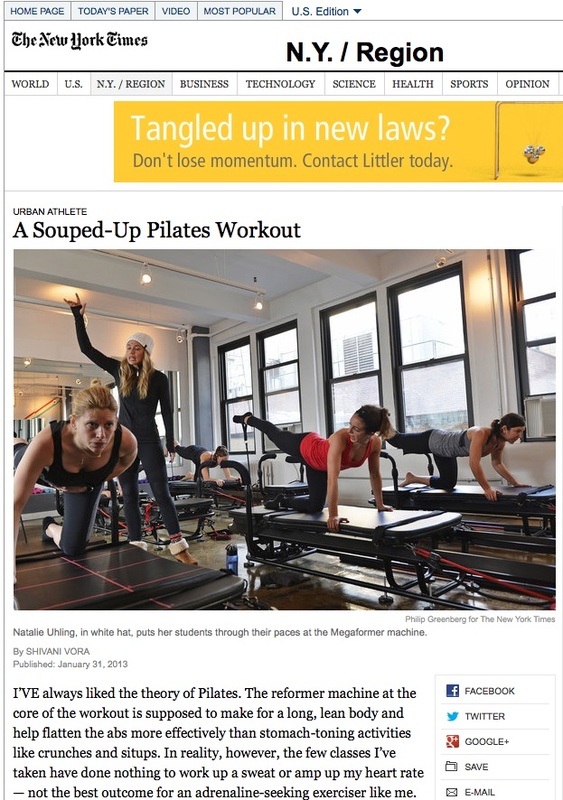 If the workout strays too far from it’s original intent then it shouldn’t be called Pilates. I will sometimes gear a class to more of a gym based exercise session, but I always specify when an exercise is not “Pilates”. This entry was posted in Classes and tagged fitness, toning on February 4, 2013 by Susan. One of the staple exercises in Pilates is the rollup. It seems and looks simple yet many people experience difficulty with it. There’s a reason – it’s not that simple! You must call on several muscle groups in a specific order to successfully perform this exercise with correct form and without risking injury. Watching this animation will help you visualize the sequence of engagement by the various muscle groups that’s necessary for successfully performing a true sit-up. Remember, it takes practice and persistence to accomplish anything worthwhile! This entry was posted in Classes on May 26, 2012 by Susan. 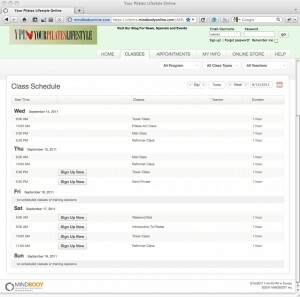 Online Scheduling Has A New Look! As we mentioned in our post last month about MindBody’s design changes to their user interface, scheduling and account management just got a lot easier for our clients. Now live, the new interface features a much-improved design and “flow” that reduces or eliminates altogether the selection and navigation bottlenecks that tended to cause problems in their earlier version. Our clients will find a much more intuitive selection process. Combined with the new graphic design, selecting classes and sessions is friendlier and simpler, virtually ending the confusion that occasionally occured previously. If you’ve put off exploring the business side of Your Pilates Lifestyle, take a few minutes and experience our new look and feel. This entry was posted in Classes and tagged classes, mindbody, packages, sessions, signup on September 15, 2011 by Susan. Don’t forget to claim your 10% discount on any class, session or package. Just enter the promotion code “summer” when you checkout and your savings are automatically applied. This entry was posted in Classes and tagged coupon, sale, save, special on June 23, 2011 by Susan.